Save time and money on your Learning Management System. Simplify your training, deliver better performance! Whether you have seven hundred employees or seven thousand, we are here to help ensure that each employee completes required training for their specific job. Traineerecords.com was developed by One World Learning Ltd, a trusted e-learning solutions provider for more than 15 years. During this time, we’ve introduced a number of compliance-oriented workplace training courses for various industries, including courses on Money Laundrying, Manual Handling, Customer Care, Product Information, Food Safety, Age Restricted Sales Training and Lean Six Sigma amongst others. One World Learning Ltd is an Endorse Education Provider of the IIBA. With a click of a button, you know who is trained and who needs to be trained per location and per manager. You get 100% visibility on your training compliance! Performance tracking with our Learning Management System means you have time for other things. We convert your courses to HTML5 for online delivery. Clean, easy-to-use courses means that all employees can train at a time that suits your business. No need to worry about interactivity, engaging the student, assessment or tracking the training, that is our job! What about employees who don't have company emails? Companies with high turnover and large numbers of employees tend not to give every employee an email - its too expensive. With TraineeRecords, employees don't need an EMAIL address to take an elearning course. Our unique approach means that training is truely available to all employees, not just those with company emails. You can purchase off-the shelf training from around the world and with TraineeRecords, you can roll out the course to all employees the same day! You can also manage your classroom training, inviting employees to attend, tracking their responses and certifying attendees. TraineeRecords means that you can respond to skills gaps with critical training and track delivery of training to all employees. Our Learning Management System tells you who needs training every week. It helps you schedule online training for staff. It tracks your training and brings compliance under control. Our Learning Management System tells you who is trained and who is not. Each of our clients benefits from the assistance of a dedicated account manager, who helps in setting the scope of your program and getting the appropriate information entered, in addition to answering any and all questions about the process. Once you’re up and running, the system takes care of itself, but it’s good to know that there is always help available if needed. Choose any scorm compliant training course, or create your own! You can purchase eLearning courses from the many training catalogs that exist online, talk to us and we will help you find a suitable off-the-shelf elearning course. Alternatively, send us your course in PowerPoint format and we’ll convert it into online training modules. Schedule training and testing automatically. TraineeRecords Learning Management System allows users to schedule training sessions online for each employee at any of your locations, on any computer and at any time that is convenient for your business. Track test scores and compliance levels immediately. 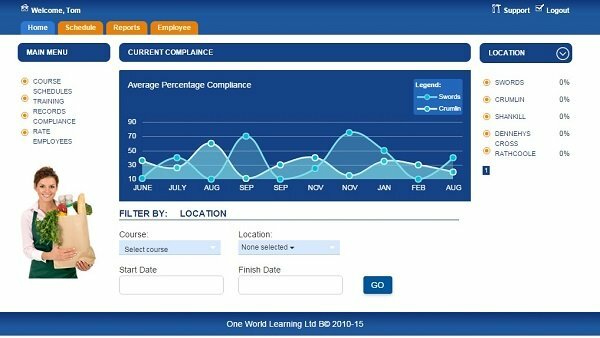 Online record keeping allows managers to instantly see which employees have completed training and pinpoint those that still need to fulfill specific requirements, enabling you to maintain compliance at all times. Turnkey solution for compliance training. Our online courses means your employees train at a time that suits your business. Let us convert your inhouse training so that you are 100% online. Don’t miss an opportunity to simpify training! Describe what you want to achieve! Copyright © 2018 One World Learning Ltd.